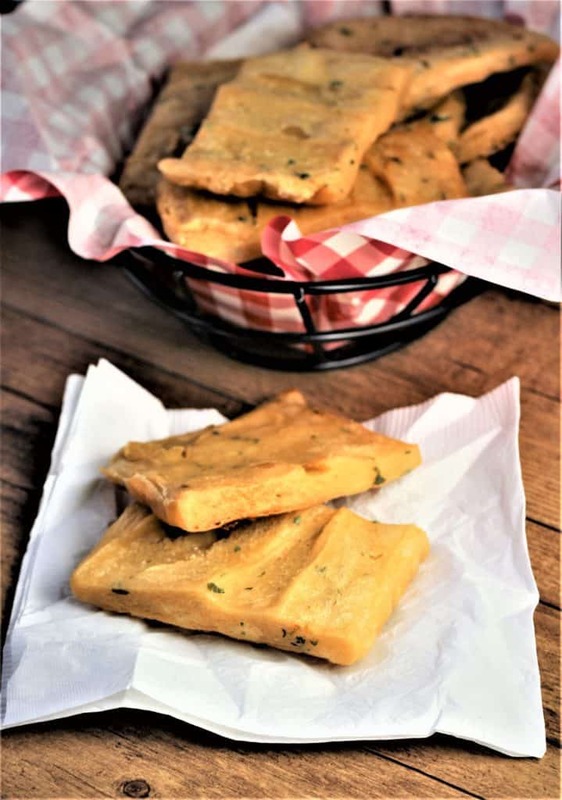 Panelle or Sicilian Chickpea Fritters are a popular street food typically found in Palermo, Sicily. I had the pleasure of sampling them for the first time in Palermo two years ago. Although they are usually sold as street food and served in a panino, my family and I ordered them as an appetizer in a local restaurant. You can read more about that trip here. The plate arrived piled with hot, crispy panelle squares and we quickly devoured them and immediately ordered a second plate. We were hooked! I had never even heard of them before, which goes to show you how specialties can vary from one town to another within Sicily. Thankfully chickpea flour is widely available in most grocery stores here in Montreal and so I was able to recreate this dish easily. 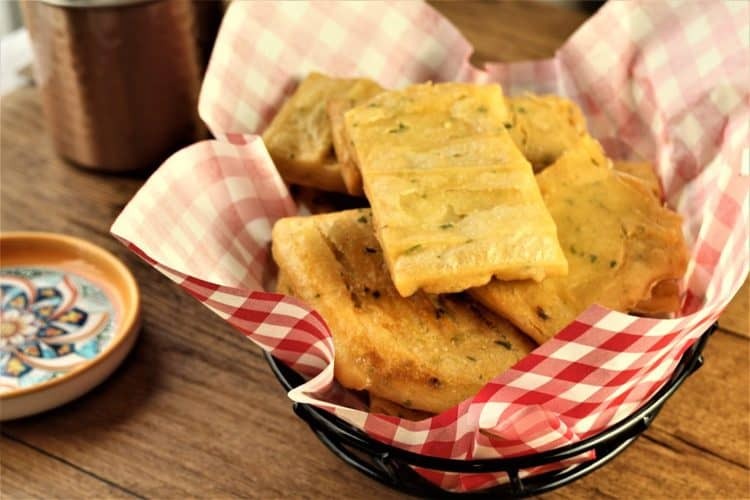 All you need is chickpea flour, water, salt and parsley as well as vegetable or canola oil for frying. I recently had the opportunity to teach this recipe in a cooking class dedicated to Sicilian specialties and my students marvelled at how a few simple ingredients can create such a delectable dish. The platter was soon empty! The first step in making panelle is similar to the process of making polenta. The only difference is that with polenta you would heat the water before stirring in the cornmeal. With panelle, the chickpea flour, salt and water are whisked together before setting on the stove. The mixture is whisked constantly until smooth and thick on medium heat. 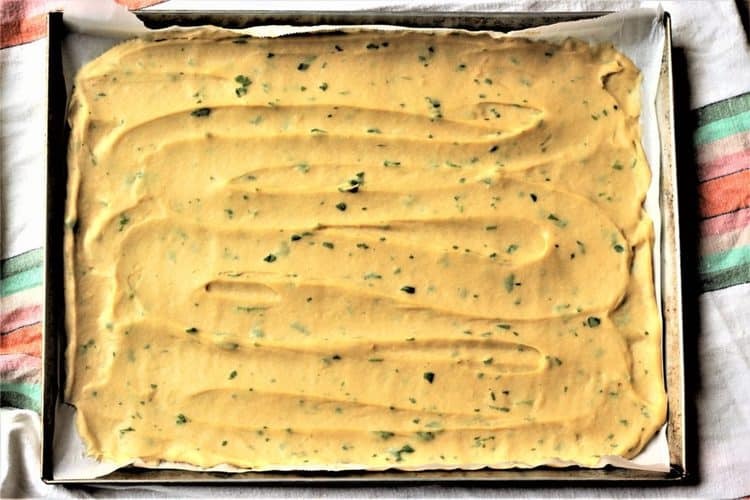 When it is ready, fresh chopped parsley is stirred in, and then the mixture is quickly spread on a baking sheet with a spatula, as shown below, and cooled completely before frying. 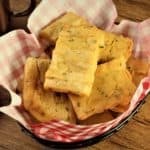 Panelle are best served piping hot out of the oil or they can be warmed in the oven just before serving. Serve as an appetizer or a simple lunch stuffed inside a panino. If you enjoy chickpeas as mush as I do, you’ll definitely love panelle. 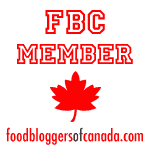 I know I’ll experimenting more with chickpea flour in the near future. Buon appetito! Panelle are typically served as a street food in Palermo, either on their own or in a panino. This recipe can not be any more simple. Chickpea flour, salt and water are combined and brought to a boil and cooked until thickened, just as with polenta. The batter is spread out thinly and allowed to cool before it is cut into squares and fried. Pour the chickpea flour, water, and salt in a medium sized sauce pan and whisk until smooth. Set over medium heat, and whisk constantly as the mixture slowly heats. Cook and keep whisking, scraping the bottom and sides of the pan frequently, until the mixture is smooth, thick and starts to pull away from the sides of the pan. Remove from heat and stir in the parsley. Pour the batter onto a parchment covered baking sheet (approximately 12” x 15”) and spread it quickly with a spatula, before it cools and sets, so it fills the pan in an even layer, about ¼ inch thick. Let cool for approximately an hour, until completely firm. Cut into squares with a sharp knife. Carefully lift the cut pieces from the pan with a spatula or your hands. To fry the panelle, pour enough canola oil into a wide heavy skillet to cover the bottom to a depth of 1/2 inch, and set over medium heat. When the oil is hot, fry the panelle about 3 minutes, until the underside is crisp and golden, then flip and brown the other side about 2-3 minutes more. Place the panelle on paper towels to drain excess oil. Drizzle lightly with salt and serve hot or warm. The panelle may also be served in a panin0.